Early Bird discount ends April 22! The Michigan Osteopathic Association will host the 120th Annual Spring Scientific Convention in Southfield Michigan, May 16-19. Join us for educational sessions, events and the 2019 House of Delegates. and specialty credits commensurate with the extent of the physician’s participation in this activity. Outcomes Survey: 3 additional AOA Category 1-A credits may be earned by participating in a post-convention survey. Join the MOA to take advantage of member rates! Call 517-347-1555 for more information. Reservations: Call 888-627-8558, mention MOA for discounted rate $135 by April 28. Once again, the host location for Spring Convention will be the Westin Southfield Detroit in Southfield Michigan. This location has proven to be a great one as it can accommodate the various sessions and features a conference room large enough to hold the House of Delegates. The rooms and suites include amenities such as flat-screen TVs, pull-out sofas, separate living areas, wet bars, in-room fitness equipment and/or whirlpool tubs. In-room spa treatments are available. Dining options include an American spot serving 3 meals a day, a bar/lounge and a coffee bar. There's a 24-hour gym, workout-gear loans and an indoor pool. A list of features and amenities can be viewed here. The Westin Southfield Detroit offers free covered parking directly connected to the hotel. Road Condition Updates: Construction and traffic accidents can cause delays. For the latest on road conditions, visit the MDOT MiDrive interactive map. The site offers up-to-the-minute information construction and incidents that may affect your drive time. 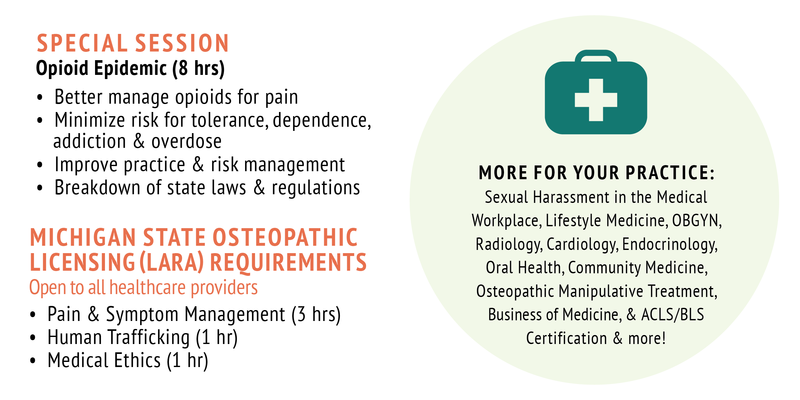 The Michigan Osteopathic Association is accredited by the American Osteopathic Association to provide osteopathic continuing medical education for physicians. The Michigan Osteopathic Association designates this program for a maximum of 32-35 AOA Category 1-A credits and will report CME and specialty credits commensurate with the extent of the physician’s participation in this activity. 3 additional AOA Category 1-A credits may be earned by participating in a post-convention survey emailed to attendees. MOA Continuing Medical Education Program Registration Cancellation and Refund Policy: Registrants for a Michigan Osteopathic Association continuing medical education program must submit requests for refunds in writing to the Association’s office. Requests for refunds must be received at least two weeks prior to the program and will entitle registrant to a full refund less a $50 processing fee. Refund requests received less than two weeks prior to the program will not qualify for a refund of the registration fees. Program brochures/registration forms shall include this information. Disclosure: All faculty participants of the MOA programs are required to disclose to the program audience any real or apparent conflict(s) of interest related to this meeting or its content. Faculty disclosure information is included in the moderator introductions and will be disclosed by faculty as they present. MOA reserves the right to change topics and scheduling without prior notice.